← 17-year old Daughter of Sarah Palin is PREGNANT? 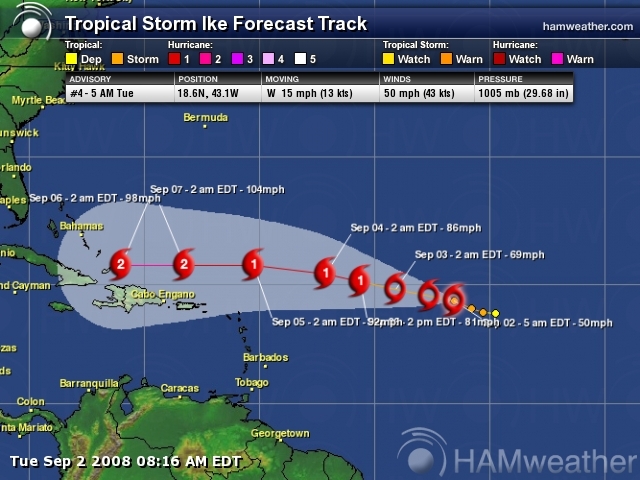 The peak time of Hurricane season 2008 has begun. 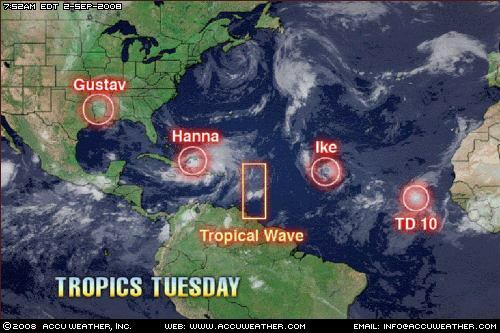 We have 3 named storms and a fourth on the way. All storms are included in this post. Hurricane Hanna (currently downgraded to a tropical storm) will be making her move within the next day or two and could impact parts of the southeastern U.S. 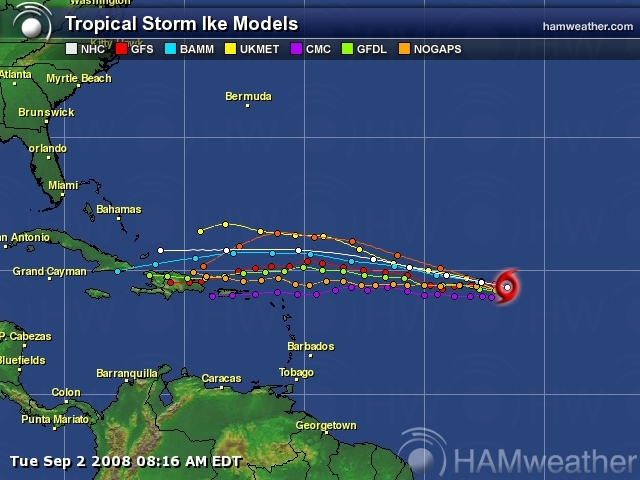 Tropical Storm Ike is churning out in the Atlantic and all models indicate that the storm will be heading toward the Caribbean and U.S, though obviously the final destination is quite uncertain at this time. 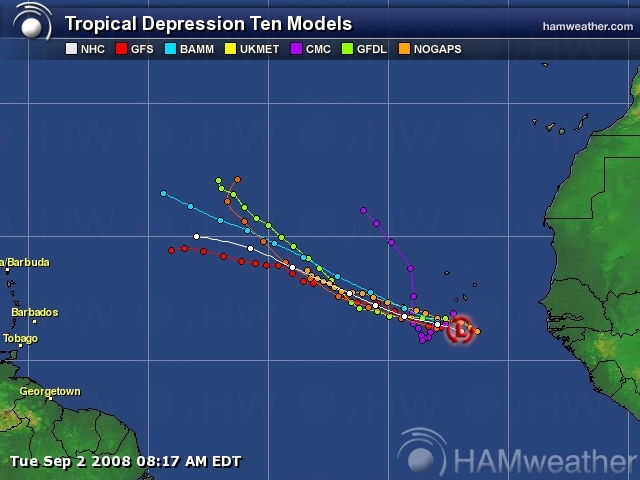 Tropical Depression 10 is expected to become Josephine later today. And Tropical Depression Gustav made landfall yesterday as a category 2 storm. Hanna was downgraded to a tropical storm with maximum sustained winds near 70 mph. 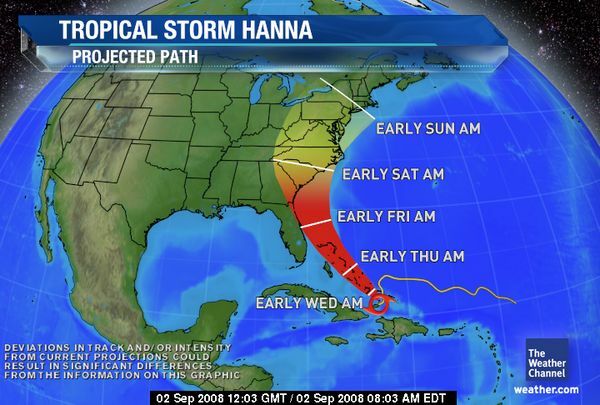 Hanna is located near 21.3 north, 73.1 west, or 385 miles southeast of Nassau. Hanna continues to move erratically, with its current motion to the west at 2 mph. A motion to the northwest is expected to commence on Wednesday with an increase in forward speed. 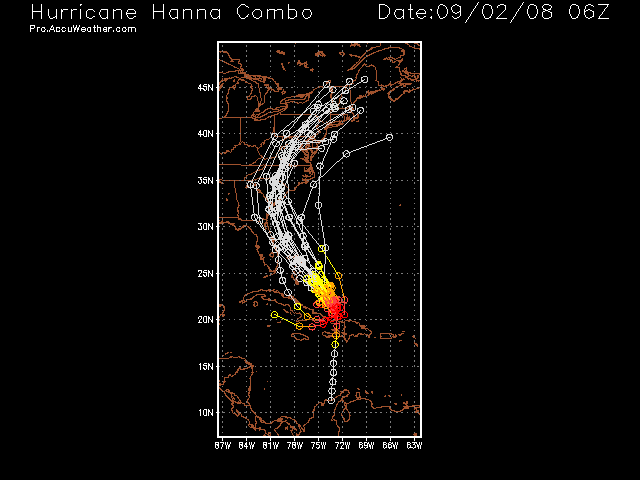 The estimated central pressure of Hanna is 987 mb, or 29.15 inches. Tropical storm-force winds extend outward up to 175 miles. A hurricane warning remains in effect for the central and southeastern Bahamas and the Turks and Caicos islands. Hanna will probably strengthen back to a Category 1 hurricane over the next 24 hours. It will also have an opportunity to increase in strength on Wednesday and Thursday and could become a Category 2 storm. Tropical storm-force winds with hurricane-force wind gusts should affect the Turks and Caicos islands as well as the central and southeastern Bahamas today and tonight. Rainfall from Hanna will increase and become more frequent in the central and southeastern Bahamas, Turks and Caicos islands. Rainfall in these areas will average 8-12 inches with locally higher amounts possible through Wednesday. Storm surge caused by the winds around the storm will average 3-5 feet above normal water levels. Large and dangerous waves will batter areas where the winds are blowing onshore. Swells from Hanna will cause rough surf and rip currents along the southeastern U.S. coast over the next couple of days. While the exact future path of Hanna is somewhat uncertain, the storm is likely to move northward and affect parts of Florida and the southeastern U.S. starting on Thursday. Gustav is expected to reach the Carolinas on Friday and the mid-Atlantic states on Saturday. 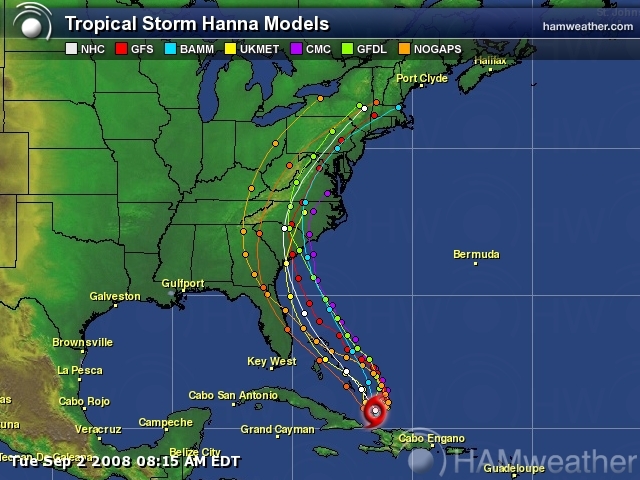 All interests in these areas need to keep a close watch on the future progress of Hanna. 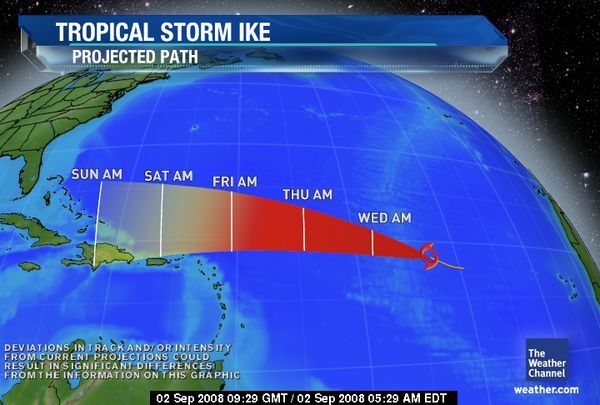 Tropical Storm Ike is near 18.6 north and 43.1 west, or about 1,235 miles east of the Leeward Islands. 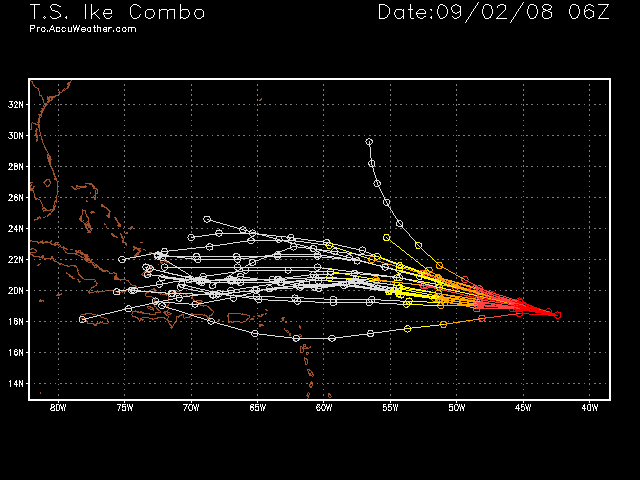 Further strengthening is expected with this system on Tuesday and Ike could become a hurricane by Wednesday. Computer guidance keeps Ike away from land through Thursday with the system passing close to or even over the Leeward Islands on Friday. Ike is moving west at 15 mph and a general west to west-northwest movement is expected to continue for the next couple of days. Maximum sustained winds are near 50 mph with gusts to 65 mph. The estimated central pressure is 1005 mb or 29.68 inches. 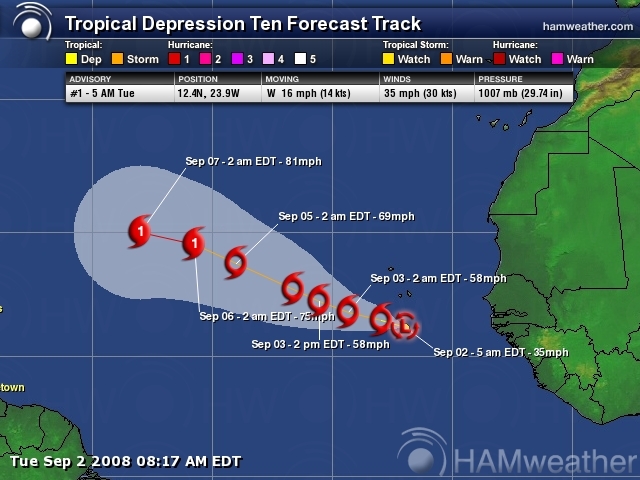 Tropical Depression 10 has formed as of 5 a.m. EDT near the Cape Verde Islands in the far eastern Atlantic. T.D. 10 is moving to the west at 16 mph and is not expected to threaten any land for the foreseeable future. T.D. 10 is forecast to become Tropical Storm Josephine later today or tonight and it could reach hurricane strength within the next five days. Gustav has weakened to a tropical depression with winds of 35 mph and it is about 40 miles southeast of Shreveport, La. At 6:00 a.m. CDT Tuesday, the tropical depression was located near 31.7 north, 93.4 west. Gustav is moving northwest at 10 mph. The central pressure is 985 mb, or 29.09 inches. This entry was posted in Hurricane Season, My2bucks Eye On The Tropics, News, weather and tagged hurricane gustav, Hurricane Hanna, Hurricane Hanna computer models, Hurricane Hanna Spaghetti Models, Hurricane Ike, Hurricane Ike computer models, Hurricane Ike Spaghetti Models, Hurricane Josephine, Hurricane Josephine computer modesl, Hurricane Josephine Spaghetti Models, spaghetti models, tropical storm gustav, Tropical Storm Hanna, Tropical Storm Hanna Spaghetti Model, Tropical Storm Ike, Tropical Storm Ike Spaghetti Models, Tropical Storm Josephine, Tropical Storm Josephine Spaghetti Model. Bookmark the permalink. Ok I need advice. I have a flight from Philadelphia to Ft Lauderdale Thursday @ 3:30 and then coming back to Philly on Sunday. With Hanna approaching, and with my general fear of flying, any suggestions? I wouldn’t worry about the flight itself. Commercial aircraft are REQUIRED to fly over and around dangerous weather like this. If the hurricane is at either airport, the flight will be canceled.